WPI professor Cosme Furlong-Vazquez (right) and post-doctoral fellow Payam Razavi in the Microelectronics Testing and Characterization lab. Worcester Polytechnic Institute (WPI) and Quinsigamond Community College (QCC) will hold the inaugural Integrated Photonics Symposium on Wednesday, Oct. 3. Aimed at advancing integrated photonics activities throughout the region, the event will feature attendees and speakers from academia, industry, and government. Photonics is an area of technology that involves transmitting and processing information with light, or photons, instead of with electricity, or electrons, while integrated photonics involves bringing electronic and photonic components together on the same chip. 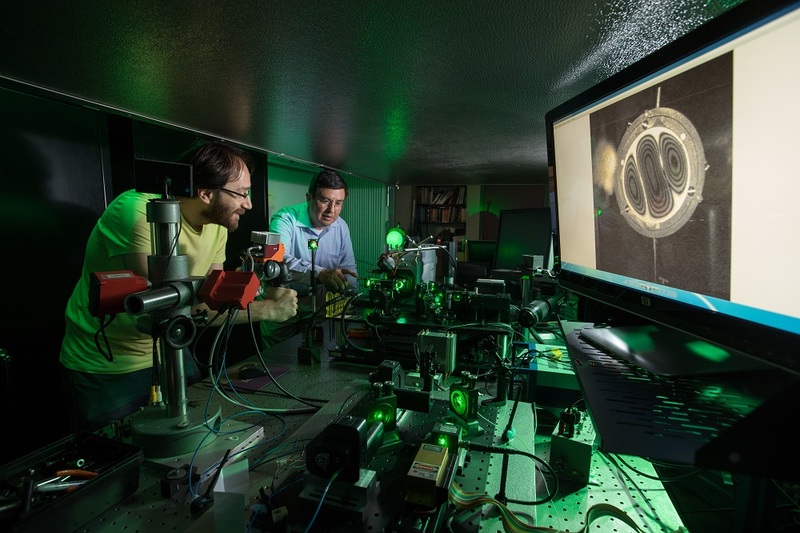 While photonics is already embedded in technologies that are part of daily life—including smartphones, medical devices, and autonomous vehicles—researchers say integrated photonics devices represent an emerging and potentially game-changing technology. In January, WPI and QCC shared a $4 million grant from Massachusetts Manufacturing Innovation Initiative (M2I2) to support the region’s burgeoning integrated photonics initiatives. The two schools are in the process of developing a comprehensive joint laboratory known as the AIM Photonics Academy Lab for Education & Application Prototypes (LEAP), which will support the growth of the nascent integrated photonics industry across the Northeast. The Central Massachusetts LEAP will help strengthen companies in the region by enabling their transition into the integrated photonics supply chain, expanding opportunities for research and development, creating additional workforce development and educational programs, and enabling new entrepreneurial activities. To learn more and see full details, visit this link. NOTE: Reporters interested in attending the WPI-QCC Integrated Photonics Symposium should contact Andy Baron at ajbaron@wpi.edu or 508-831-5916. This event is being organized in coordination with The Future of Manufacturing Symposium, hosted by MassMEP, on Thursday, Oct. 4. To learn about this event, visit www.massmep.org/event/the-future-of-manufacturing-symposium.